Samsung on Friday launched a range of audio products in India to expand its product portfolio in the country. The South Korean company launched three portable speakers, Level Box Slim, the Bottle and the Scoop, along with Level Active and the Rectangle headsets. The Samsung Level Box Slim has been priced by the company at Rs. 6,699, while the Bottle speaker comes with a price tag of Rs. 4,999. The Scoop speaker is available for Rs. 2,799. The Level Active headset has been priced by Samsung at Rs. 4,999 while the Rectangle Headset is available at Rs. 1,899. “Samsung is synonymous with innovation and our new Audio range reinforces us as pioneers in the Mobile entertainment space. Each of these audio devices, with their balance of aesthetics and acoustics, should be a definite delight for our consumers,” Asim Warsi, senior vice president at Samsung India Mobile Business, was quoted as saying in the release. Talking about the portable speakers first, Samsung Level Box Slim works as both an audio speaker as well as a power bank. The speaker comes with a 2600mAh battery that is rated to provide up to 30 hours of music playback and as we mentioned earlier, it also functions as a portable charger. This means that users can charge their smartphone or tablet while listening to the music from the speaker as well. Notably, with the help of Samsung Level app, users will be able to check the status of their speaker’s battery and adjust the volume settings as well. The Level Box Slim comes with IPX7 water resistance, which means you can take it around swimming pool or lake and not be worried about occasional splashes. The speaker comes with a compact design and can fit into user’s palm or back pocket, as per the company’s claims. Next in line is the Samsung Bottle speaker. The portable speaker supports wireless charging and offers 360-degree surround sound as well. The speaker interestingly supports motion-controls as well. The built-in LED panel on the speaker is responsive to motion and can be customised by the users with the Lux Manager app. Finally coming to the Scoop wireless speaker, the new portable comes with a strap that makes it easier to carry around. “Intuitive controls allow users to effortlessly find their favourite tunes, while the built-in microphone with noise-reduction and echo-cancellation technologies help users to field calls without reaching for their phone,” the company said in its release. 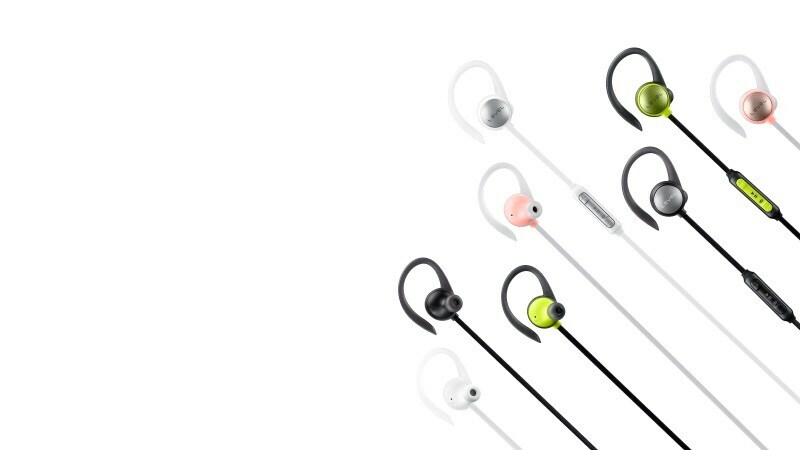 Moving on to the headphones, the Bluetooth-enabled Level Active headset headset comes with silicon earhooks as well as wingtips and in-ear earbuds, making it comfortable for people on the move. The headset is also splash resistant, which allows users to work out without worrying about sweat. “Using the Active key function, users can control their Level Active headphones to monitor their workout. Users can connect to S Health using Active key and record workout information for walking, running, cycling or hiking,” the company said in its release. Lastly, there is Rectangle headset that comes with a tangle-free flat fabric cable and DLM (double-layered motion) structured speakers for top-notch sound, the company said.